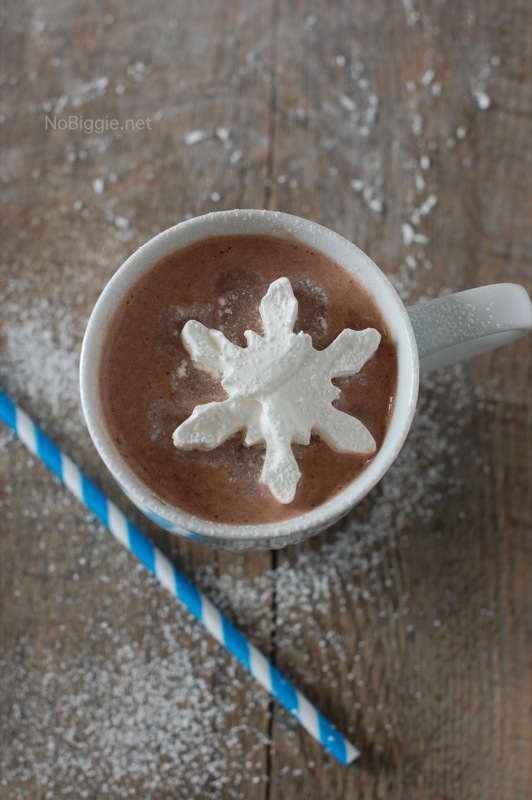 Make festive snowflakes for your Creamy Hot Chocolate with cool whip! Have you ever made homemade marshmallows? I have once and it was pretty messy. Sometimes, it’s hard to justify the time and mess of homemade marshmallows when it’s only .99 cents to buy a bag of marshmallows at the store. I will say, that one of the best things about homemade marshmallows, is that you can use cookie cutters to cut out cute shapes. 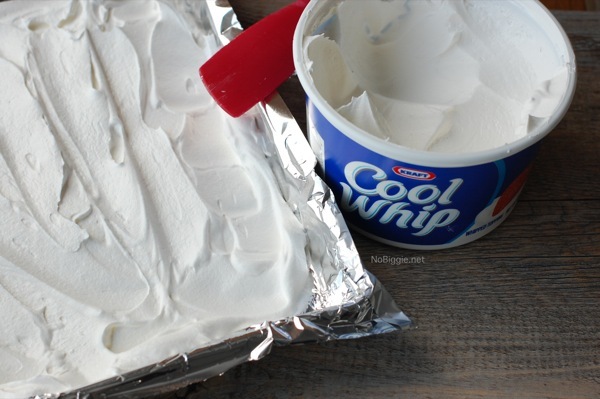 Here’s a shortcut…cool whip! 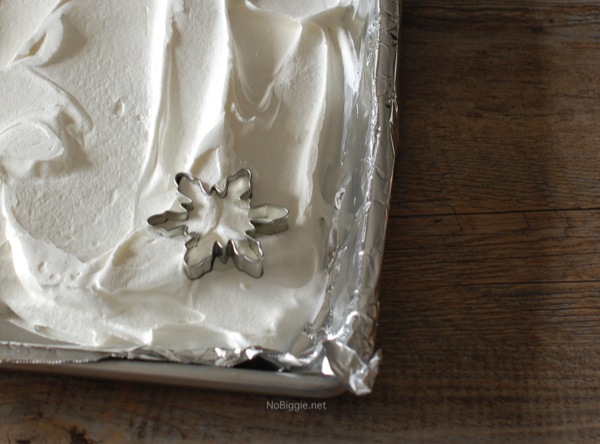 When you freeze cool whip on a cookie sheet, you can cut it out with cookie cutters. It’s like the look of homemade marshmallows without the time (and mess) of actually making marshmallows. It’s so great! This trick will wow your kids, and the best part is that the frozen cool whip will help cool down the hot chocolate. 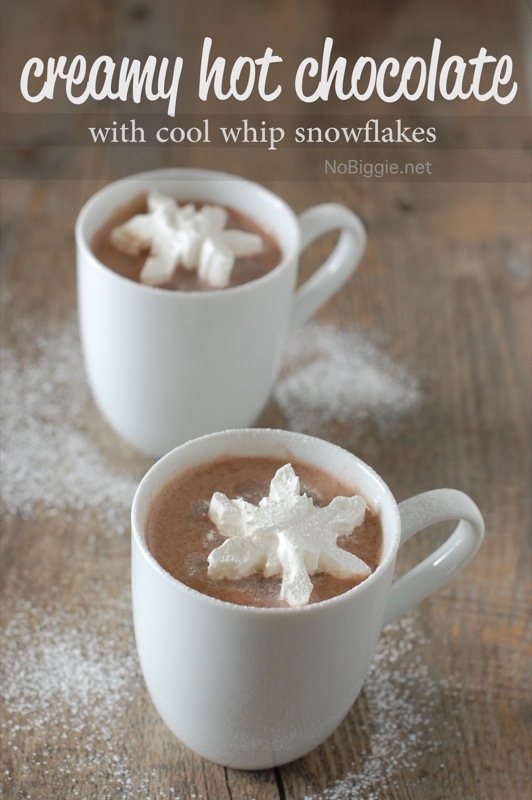 This time of year things like warm creamy hot chocolate with cool whip snowflakes sure can help you embrace the cold months ahead. Just spread some cool whip on a small quarter sized pan lined with tin foil and freeze for an hour or so. Take your little cookie cutters and press down all the way and pull up. I used the smallest snowflake from this adorable set of snowflake cookie cutters. It’s the look of homemade marshmallows without the time and mess that comes with. Isn’t that great?! Here’s our favorite recipe for creamy crock pot hot chocolate. What are you doing to make winter more enjoyable? These are adorable! 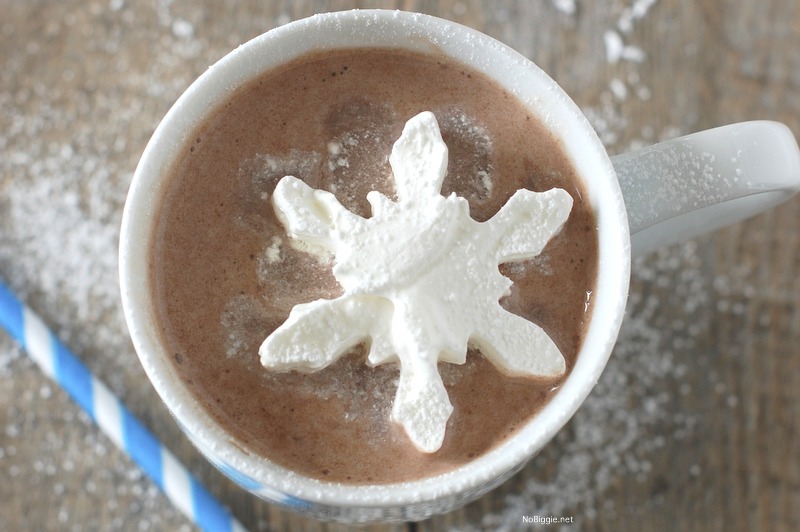 My kids LOVE hot chocolate and this is such a fun twist- I know they’ll go crazy for the snowflakes! you are speaking my language!! my love language. I’m not signed up to go to BYB. I don’t think I’m going. Who are you going with? Can’t wait to try – so fun!! You rock! There’s no way I would make my own marshmallows, but I’m all over my own frozen cool whip snow flakes!! I love this!! So easy and so cute! Where do you store the snowflakes when not using them back in the freezer? and would keeping them in a freezer bag mess the shape up or what do you put them in? On a flat rimmed small cookie sheet, inside a ziplock bag… if you are worried about them getting bumped in the freezer. How long can they stay out at a party before melting? Hi Toni! – I’m not sure on this one. probably 30 minutes or so? I loved this idea too. I put mine on a aluminum foil covered sheer and left it overnight. The cool whip doesn’t become firm enough for the cut outs to hold their shape…..unfortunately.